Month running Floor Regulator. Only available from Oakside. High quality seconds pendulum cable-driven movement with a winding period of 31 days. The cabinet back is made from a rare fine quality Macassar amaro. Five year mechanical movement warranty. 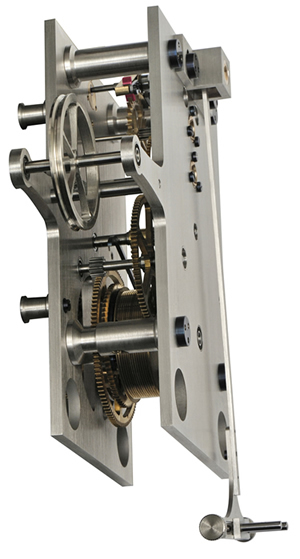 The Graham escapement has bolted agate pallets and maintaining power so that the mechanism continues to run while it is wound. The spindles are mounted on rubies and precision ball-bearings. The six ruby bearings are enclosed in bronze chatons, five of them bolted. The massive construction has rhodium plated components. Click here to view the Hermle 01241-747761 Masterpiece Options and Prices page.